During your time here, has the company changed? If so, how? The company has changed tremendously. When I started, the Hanover office was a small operation with just a couple of contracts. Now, it’s booming! We have a lot of people here – and have filled up two buildings. We’re even expanding to new places in Maryland. Despite all that, I still try to get to know as many people as possible and do what I can to make them feel like they’re a part of something special. My current job. I get to do a little bit of everything. One day, I’m planning a meeting with government executives and the next, I’m on a plane with senior leaders to visit our staff in San Antonio or Denver. I really enjoy the diversity of what I do and how I play a small role in support of an important mission. How do you balance career and home life? It’s hard, since both my husband and I work for ManTech. We have to trade off. Sometimes I have to work late and he covers “kid duty,” and other times it’s on me. During the winter, we don’t take a lot of time off, but try to do our best to get out of the office for a couple of long camping trips during the summer. Work hard and have fun! We have a great thing going here. We’re winning a lot of new work and there are tons of great opportunities to grow. On top of that, do what you can to make your workplace fun and exciting. The contracts I work with have cookouts, game nights, trips, decoration contests and happy hours. It’s a great environment where we support the mission and make great friends. Not surprising to those who know me – but it’s taking care of people. I really like being able to take care of my family, friends and coworkers. I get great satisfaction by making everyone around me happy and ensuring they have all they need to do well in school, at work, on a trip or just day-to-day work. How do you get your caffeine in the mornings? With as many people as possible. Normally, I go with five or six people and we discuss what happened the night before and what’s going on for the day. It gives me a chance to connect with everyone. My dad. He overcame so much in his life to get to where he is now. He came from a poor family in Vietnam, did an amazing job in school, became a military officer and earned his Ph.D., then started all over in the United States after the Vietnam War with nothing but his brains and determination. While raising a family with four kids, he went back to school here and got another Ph.D. He was able to support us and serve as a leader to bring the South Vietnamese community together in the United States. Even now, he continues to work harder than most people half his age. I hope he’ll retire in a couple of months and I’ll get to spend a lot more time with him. What does “Securing the Future” mean to you? It means continuously adding new capabilities to our company to enable the government’s important mission work. We have done so much over the last 50 years to support the country, and I know we have a lot more to do – especially as we get bigger and take on more contracts. 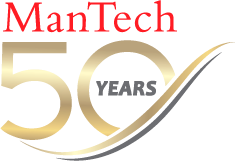 Increasingly, it’s going to be ManTech’s responsibility to deliver what is needed to secure the future of our country.